Standard Industrie International designs equipment that facilitates the storage, flow, conveying and cleaning of powdered and bulk products. 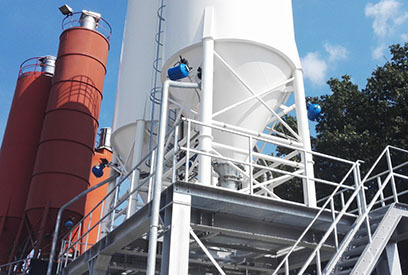 First of all, our company is the leader in the field of unclogging, especially silos and hoppers thanks to our flagship product, the AIRCHOC® air cannon, whose patent has been filed for nearly 40 years. Eager to innovate, it subsequently designed the MACSYS®, a multi-headed air cannon, perfectly suited for hot spots and hard to reach parts. In order to better meet the needs of customers, the company developed a wireless version, called Wireless. Adaptable to AIRCHOC® and MACSYS®, as its name suggests, this innovative concept excludes the installation of cable trays. Thanks to a box set and a remote control, up to 128 air cannons can be remotely controlled for optimum safety. As of now, our multinational branch offers the widest range of air cannons in the market. The principle of these solutions is simple : a volume of compressed air that varies between 1 and 400 litres is instantly released. The effect obtained corresponds to a deflagration due to the sudden expansion of compressed air. The shock wave towards the product allows the materials to flow. The AIRCHOC® has a worldwide reputation in proving itself in the bulk market over the last forty years. Standard Industrie International has also developed the LIFTUBE®: a powerful solution for conveyor belts to optimize their waterproofness and safety. This system ensures a reduction of dust emissions, material losses, maintenance time and guarantees the operator’s safety. Available in standard and wide versions, the LIFTUBE® can benefit from specific equipment adapting to food environments, high temperature, ATEX zone 21, or flammable environments. Standard Industrie International is also a designer and manufacturer of equipment for industrial vacuum cleaning. Its know-how and knowledge of industrial processes, complemented by a personalised study, enables to provide the best technical and economic solutions to applications encountered while ensuring a healthy environment for operators. Wood pellets suction with a portable GAD Suction Group in thermal power station. Finally, Standard Industrie International offers cleaning and unclogging services of storage units thanks to the POWERNET and GIRONET®. These two products, available in pneumatic or hydraulic versions, and effective on all types of clogging, products or storage units, can be used without halting the production. This mechanised cleaning is done safely since it excludes human interventions inside the silos and hoppers. Moreover, all risks of explosion are avoided thanks to the use of compressed air and an aluminium housing around the engine. Thus, the customer quickly recovers all of his storage capacity while ensuring optimal safety for his operators. Standard Industrie International has established itself worldwide as a leader in bulk handling. Hence, this originally French company intervenes in very varied sectors of activities such as cement works, thermal power plants, iron and steel industries, mines, quarries, etc. to provide them with all the necessary solutions in terms of materials handling, production capacity recovery, the workplace, and even safety.